Love-Based Copywriting System: A Step-by-Step Process To Master Writing Copy That Attracts, Inspires And Invites (Love-Based Business) (Volume 2) | The Millionth Circle | The Friendship Factor | Stop Being Lonely | When Friendship Hurts | The Friendship Fix | Friendships Don't Just Happen! With the constant connectivity of todayâs world, itâs never been easier to meet people and make new friendsÂbut itâs never been harder to form meaningful friendships. In Frientimacy, award-winning speaker Shasta Nelson shows how anyone can form stronger, more meaningful friendships, marked by a level of trust she calls Âfrientimacy.â Shasta explores the most common complaints and conflicts facing female friendships today, and lays out strategies for overcoming these pitfalls to create deeper, supportive relationships that last for the long-term. Shasta is the founder of girlfriendcircles.com, a community of women seeking stronger, more fulfilling friendships, and the author of Friendships Donât Just Happen. In Frientimacy, she teaches readers to reject the impulse to pull away from friendships that arenât instantly and constantly gratifying. With a warm, engaging, and inspiring voice, she shows how friendships built on dedication and commitment can lead to enriched relationships, stronger and more meaningful ties, and an overall increase in mental health. 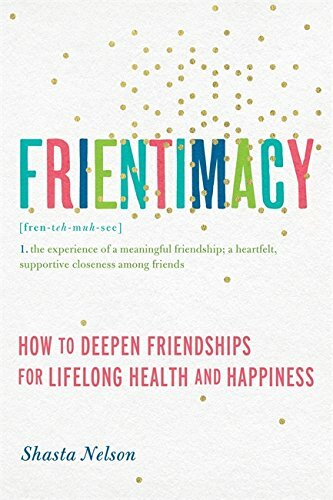 Frientimacy is more than just a call for deeper connection between friends; itâs a blueprint for turning simple friendships into true bondsÂand for the meaningful and satisfying relationships that come with them. About: With the constant connectivity of today’s world, it’s never been easier to meet people and make new friendsbut it’s never been harder to form meaningful friendships.